Midlife facelifts can be tough things for car manufacturers to carry off, especially when the car in question has already established a reputation as one of the best-looking models in its class. Such a quandary confronted Alfa Romeo when tasked with giving their 147 hatchback range a wash and brush up in 2005. By modern standards of automotive product planning, five years was a long time for this car to have been on sale with no major amendments and few thought the revisions would add up to much but the changes have been universally admired. Giving the 147 an even sharper, more distinctive appearance without uglifying the basic shape in any way, this is one of the most deft tweaks in recent memory. Small wonder that sales have been revitalised and low mileage examples are still hot ticket items in the used arena. In order to understand the position that Alfa Romeo found themselves in when tasked with updating the 147, a brief primer as to what went before is in order. The potted history includes a 1998 European Car of The Year title, the introduction and then deletion of a fire breathing 3.2-litre GTA variant, the unveiling of increasingly competent diesel models and then a revision of the range's trim designations shortly prior to the facelift. February 2005 was the date that the revised cars rolled into dealerships and there are now quite a few low mileage cars to choose from. They're distinguishable by their pointier front headlamps, their reshaped bumpers and their larger rear light clusters. More salient was the JTD 16v engine's increase from 140bhp to 150bhp and some comfort-orientated tweaks to the suspension settings. Some late stock GTA models were also registered on later number plates but the GTA was never treated to the facelift. 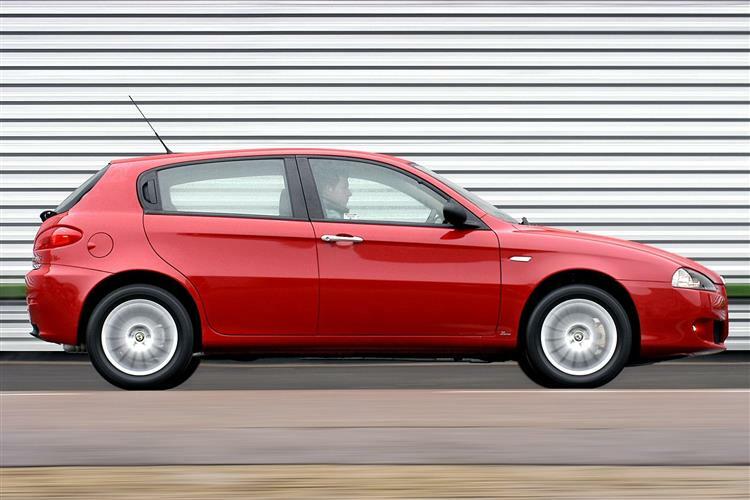 In spring 2006 Alfa introduced a value-packed TI model that offered sporty looks and an aggressive price tag. A limited slip differential was made available early in 2007. Offered with the 150bhp diesel engine, models featuring this gadget were badged Q2. Taking its cue from the marque's excitingly styled Brera, the revised 147's headlamps are a good deal sharper, tapering to inboard points. These lamps feature triple lamp clusters and a revised bumper houses tiny front foglamps and far more aggressive air intakes. The rather odd black rubbing strips that sat below the lights on the old car were replaced, giving the latest 147 a far more chiselled look. Walk round to the rear of this Alfa and you'll spot a chromed strip at the bottom of the tailgate which should do a very good job of dissuading following drivers from high beaming you. The rear lights are a good deal larger than before, smeared across the tailgate and rear wing. A redesigned lower bumper assembly houses the number plate and the rear end of the car is nicely finished by a reprofiled tailgate that makes the Alfa badge significantly more prominent. It's tough to spot one bad angle. This facelifted 147 enjoyed more than just a mere freshening. Fundamental aspects of the car were thoroughly revised. The interior came in for a little attention, the designers charged chiefly with improving the perception of quality. Soft touch two-tone fascias came in, as did moves to make the instruments that little bit more legible. Other more elemental changes to the car included a revision to the suspension, aimed at improving ride quality. A 'Comfort' option on some models allowed for a more relaxed ride. Revised damper settings and a wider availability of electronic driver aids such as anti lock brakes, brakeforce distribution and stability control were also featured. The 147 feels well built and for those who do know how to wield a spanner, it isn't the nightmare to work on the Alfas of yore were. The Selespeed model has an appetite for clutches if used predominantly as an urban scoot and you should also check wheels for kerbing. The interior trim is generally of good quality although the metallic paint on some of the plastic surfaces isn't too durable. The batch of porous engine blocks that plagued old 147s became a distant memory with this facelifted version, crushed under the weight of vastly improved quality control. The 147 is also very colour sensitive, working well in bold solid colours and subtle metallics. In-between colours like Gabbiano Blue and Giannutri Green may be harder to shift. Negotiate hard for discounts on less-favoured paint finishes. Nuvola Blue is always a favourite. (based on a manual 2.0 Lusso) A clutch assembly is around £138. Front and rear brakepads are around £50 per set of each, a rear exhaust box about £143 (excluding catalyst), a starter motor around £190. A replacement headlamp is about £175. Alfa has gone to great lengths to make huge steps forward over the 145/146 generation of hatches. That much is evident as soon as you drop into the driver's seat and thunk the door shut. It's a completely different prospect, with some resolutely high tech touches like its Vehicle Dynamic Control, a stability control system which aims to prevent the 147 spinning. It's on a par with the PSM program used by Porsche in the way that it credits the driver with some leeway before gently stepping in to restore equilibrium if progress is overenthusiastic. Whilst it always seems such a great idea in principle, driving a Selespeed-equipped clutchless 156 often left one wondering whether the handbrake is sticking. Not so in the 147. The system was optimised for smoother full-throttle gear changes and a cleverer full-automatic mode, though it still helps to lift off the gas whilst changing up through the 'box. The way the engine blips the throttle for you on downchanges is one of the enduring pleasures of using Selespeed, and you'll be enjoying it even more in the 147. Unlike the early 156, which has relied on some rather unappealing buttons mounted on the face of the steering wheel, the 147 gets for proper paddles located behind the wheel, much as you'll find in a Ferrari. These move when you spin the wheel, making it far easier to snick up and down the box, and the car's telepathically quick steering means you'll rarely have to lift your hands from that optimum quarter-to-three position. Unfortunately it also means a turning circle visible from space. The manual car is still the most popular option for keen drivers and the rest of the 147's chassis is well up to par with the slick gearbox. The Ford Focus and the Honda Civic are probably superior to the 147 over a twisty road course, but neither gives you that buzz when your garage door whirrs up. 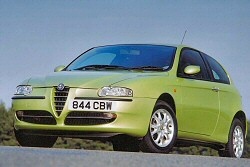 That sort of emotional twang is what kept people buying Alfa Romeos when they were, frankly, pretty poor. Now that they're as good as the 147, you may find yourself rapidly running out of excuses. Some elemental changes to the facelifted car include a revision to the suspension, aimed at improving ride quality. There's a great deal of 'tuneability' in the double wishbone front and MacPherson strut rear setup and weight has been reduced significantly. A 'Comfort' option on some models also allows for a more relaxed ride. Revised damper settings and a wider availability of electronic driver aids such as anti lock brakes, brakeforce distribution and stability control are also featured. Although it's still an individualistic choice, a used 147 is no longer quite such an adventurous one. All the years of manufacture ironed out any niggling issues and the 147 is now a pretty well sorted car, the facelift giving it a decent wash of modernity too. The pick of the bunch is probably the 150bhp diesel, but other than the slightly overwhelmed 1.6-litre petrol engine, it's tough to make a bad choice. With a respectable amount of used stock to choose from, take your time and track down a car to be proud of.